People are now looking for simple ways of redecorating their homes. With trends changing each season, it can difficult to keep up with the constantly up keep that goes with the latest must have arrangement. These changes are never cheap so that is why people are looking for affordable luxury, that can give them that revamp without having to fork out for it. In light of this, it has seen the emergence of wall stickers. Wall Stickers are the quick solution for adding style to any room. Their unique designs catch the eye and what people love so much about them is the quirky images they can have. 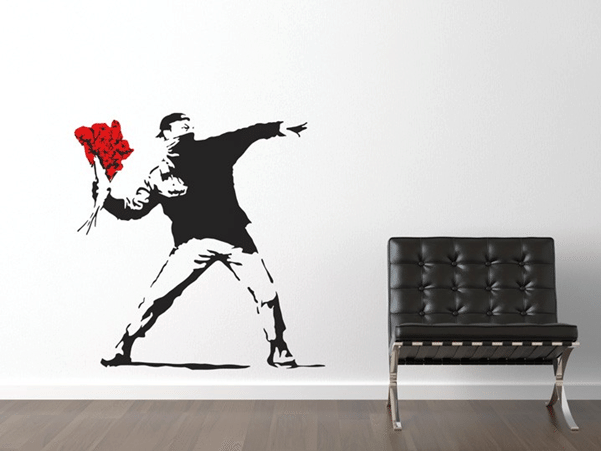 Whether its world maps, music icons, scenery or even Banksy wall stickers, people are starting to get on board with the trend. So who is Banksy you may ask? Well not even we know as he is an unknown artist who has kept his identity private. Banksy one of the biggest name in art and his graffiti is adored around the world. He is known for his political art as it combines powerful messages and dark humour all his signature stencilling technique. His art has been featured on streets, walls and bridges of cities throughout the world and now with wall stickers, you can get his best pieces in your own home! A poignant piece, this design shows a man fighting for what he believes in. Created for a political wake up, the image shows one mans stance against war and how he promotes peace. A hard-hitting, anti-violence message, the art really gets you thinking. A shared emotion it just shows a beautiful contrast that is admired by many. The art is produced in a striking black and white stencil with bold use of the vivid red flowers to emphasis its message. Inspired from the 1994 cult film, Pulp Fiction, this Banksy piece was first seen on a wall located in London in 2002. 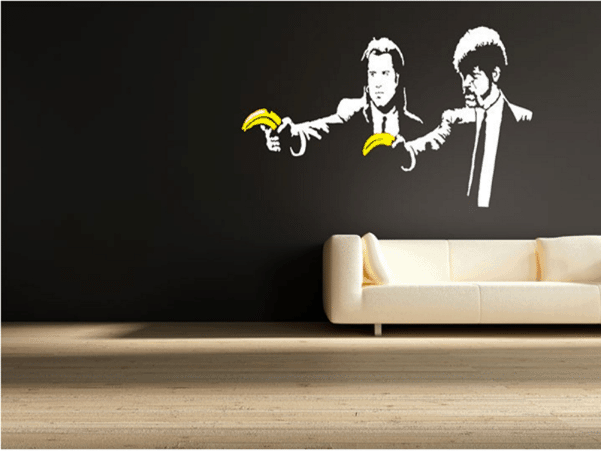 Here Banksy put added humour to an iconic scene by superstars John Travolta and Samuel L. Jackson serious scene and replacing their guns with bananas. A striking image, it’s a light hearted take on a dark image, which is why its a fan favourite. Your may immediately be thinking is this an ode to the Disney movie ‘Up’ but unfortunately its not. 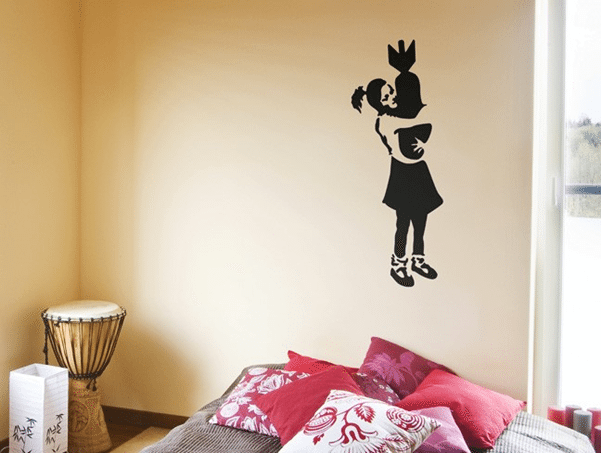 This floating balloon wall sticker is a calming and intriguing stencil. One of the top wall decals to own, the design offers the feeling of being set free and letting go to escape. It works so well in living space as it gives off the concept that she is floating and drifting away. As a result, the beholder experiences a stress free feeling that helps them relax and takes their mind of the long day they may have experienced. It is believed that the image encapsulating the wonders of being a child and perfectly expresses the innocence they have. One of the more serious Banksy images, ‘The Bomb Girl’, is another strong message towards war. A huge political statement, it causes a blunt and honest view on the effects of war and the damaging influence it can have on the children of the world. Controversial in its approach the image was drawn to cause a reaction and hit home by showing the horrible impact the war had on kids and how it took away the joys of being a child. 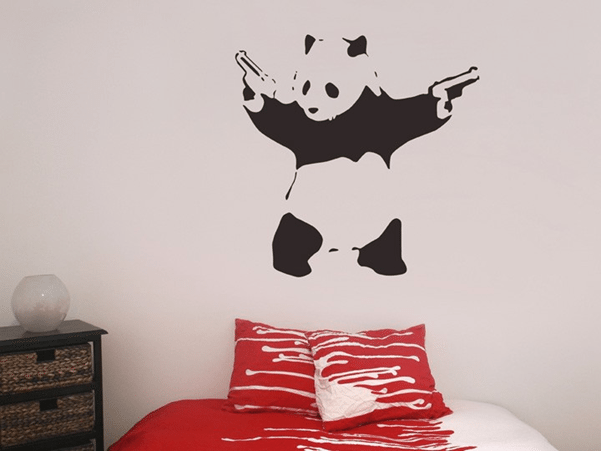 An urban design with edge, this Panda is one of the stand out wall stickers that shows a Panda wielding guns. Loved by the younger generation due to its silly nature, it is a trendy piece that cleverly gives people an insight into your personality all through an image. Banksy’s gun-toting panda screams style and adds an alternative point to any plain wall. Its true the piece of art that makes you stand out from the crowd and creates a focal point for any guests!